With Hoboken’s growing young and Modern Orthodox community, the city across the river from Manhattan finally welcomes it’s first kosher restaurant. Maoz Vegetarian is a tasty falafel chain that has numerous locations around NYC and has become fairly popular amongst Jews and non-Jews alike. The hasgacha is provided by Rabbi Israel Steinberg. 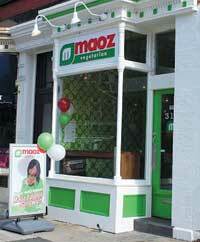 Maoz Vegetarian is located at 315 Washington St. in Hoboken.